As many of you may remember from some of my experiences, including this one, research has a way of happening in all sorts of interesting settings. What I love about authors is that they also find unique and interesting ways to bring their books together as well! Speaking of…. I get soooo excited when I have an opportunity to introduce you to new things and new people. Especially fellow authors. Have y’all met P.A. DePaul? If not, you’re about to. And if so? Stick around. She’s got some cool stuff to share with us! Hello Kitt!!! Thank you so much for allowing me to take over today and talk about how hands-on experiences have impacted my writing! Who am I? So glad you asked! My name is P.A. DePaul and I’m the author of the Romantic Suspense, SBG series. Exchange of Fire, SBG #1 introduces a clandestine Black Ops team working for SweetBriar Group (AKA SBG), a corporation the rest of the world believes is an environmental company. In my opinion, one of the best ways to gain knowledge about a topic is to experience it. Sounds reasonable, right? Common sense, really. But what if you write about a Black Ops team who run covert missions? Hmmm…now that simple sentence gets a little trickier. Enter the Writer’s Police Academy. Oooh! I’ve heard about this. Another author friend of mine went to one this last year as well. Wonder if she was at yours? Anyway. Back to you. It sounds like things are about to get exciting! Now we’re talking! While I may not need every aspect in that definition for my SBG Series, I’m able to surround myself in a world where I would normally be shut out. Now, as I said in the opening line, gaining knowledge through experience is the best way. In WPA, they offered Hands-on training. I can’t stress how valuable this was for me. In the two years, I got to perform building searches (you know, like on TV when the police are stacked outside a residence and they burst in and begin searching the home for the suspect), use a Glock in “real-life” simulations (the gun was modified with a laser “bullet” so when I hit the screen, I didn’t actually put a hole through it <grin>), put on the bomb suit and pass their “test” (the suit is over 80 lbs and they lay you on your back and you have to stand up without help…I did it! Wasn’t pretty, but I did it! ), drive an ambulance in a specialized simulator to rescue victims, sit in a surveillance plane as the instructor described all the aspects regarding aerial searches, hand-to-hand combat where I disarmed “bad guys” of their guns and knives, and a self-defense class that allowed me to yell and curse at the top of my lungs while I beat the snot out of an assailant. Whew! And this is only what I participated in. 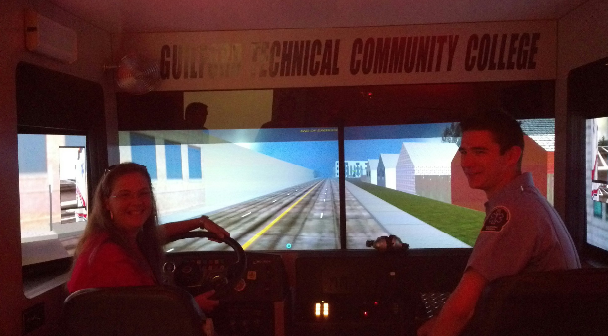 There were so many more hands-on activities I just couldn’t get to. What did all of this mean for writing the SBG series? Everything! Before I attended WPA, I could not fully describe any of the above situations. Sure, I could technically state the Glock was black but not how it felt in my hands or how nervous I was as the real-life scenario burst up on the screen and I had seconds to react or how I had trouble releasing the magazine because my hand was too small for the grip. All of this gave me so much more perspective. It allowed me to add emotion and a deeper description to every nuance of the scene. 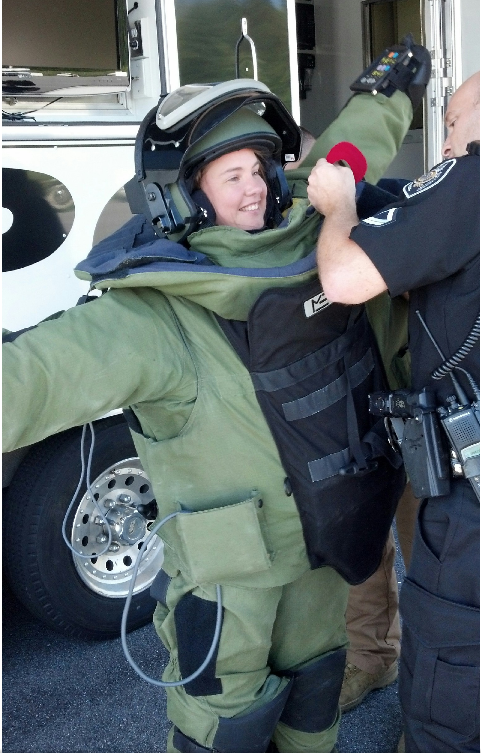 I also never would have been able to put on a bomb suit anywhere else or truly feel how claustrophobic that suit was and how heavy! I could go on, but I think you get my meaning. Having the hands-on experiences have helped me take my scenes to the next level. Thank you so much for taking the time to experience one of the nuances of attending the Writer’s Police Academy with me! Do you have any questions? I’ll promise to answer almost anything (I have to put “almost” in there because I know you crazy (wonderful) folks can come up with some doozies, so I want to reserve the right to make up an answer for those). By the way, I’ve got pictures to share with you guys, too! Wow! Now that’s taking your art seriously. What an exciting class to take. Now I need to find an excuse to take a class like this, too! It sounds like such a cool experience. Soooo…. you gonna share with us a hint of how you brought all this together? If you get a chance, you really should. As for bringing everything together, how about an excerpt and teaser? Heck, I’ll even throw in a giveaway opportunity at the end! I’m totally good with that! In the following excerpt, our heroine, Wraith, and our hero, Casper Grady, have just escaped an assassination attempt when they were inside Wraith’s apartment. Wraith knows she needs to disappear and has to convince Grady to join her in order to keep him safe. A little background: Wraith (sniper of Delta Squad) faked her death after her last mission went horribly wrong in order to escape SBG (or more accurately its CEO). The CEO got wind that she’s still alive and instead of celebrating, he sent assassins after her to rectify her still breathing status. Just like that, the spell was broken. He dropped his arms and stalked forward. She held her ground. Just watching him move closer had her adrenaline pumping and her skin tingling in anticipation. He stopped inches away, his height looming above her. So not the time to notice how full and inviting his lips were. Nor the time to breathe in his addicting scent and instantly be ready for him. His gaze darkened as it captured hers. He raised a hand and traced a finger down her cheek. “Since you’ve made it clear time is of the essence . . .” he said, his voice low and husky. Her heart skipped a beat. Damn her for that statement. “I’ll make this brief.” He leaned down until he was a breath away from her mouth. 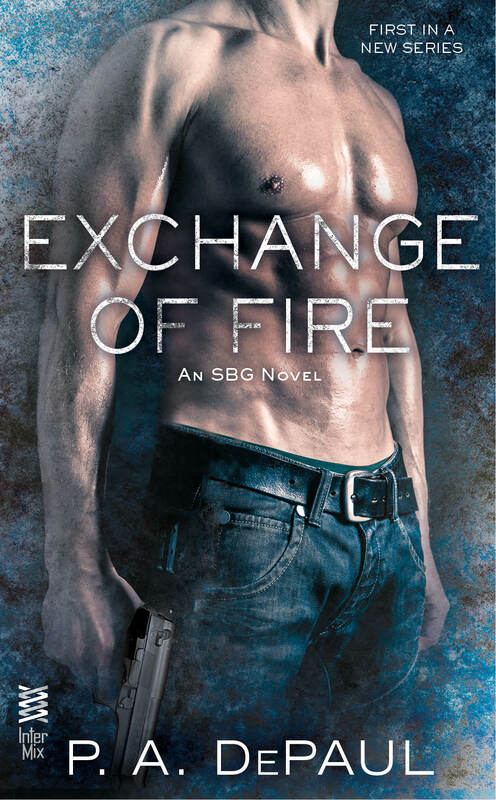 PA is offering a tour wide giveaway of 5– $10 Amazon or B&N gift cards (winner’s choice) plus 4 e-copies of Exchange of Fire (sent via Netgalley). 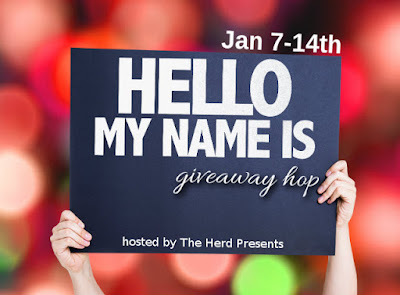 Just check out today’s post, leave a comment, and then fill out the giveaway widget! Be sure to check out all of the stops! Read fun,new content at each stop plus learn extra ways to enter the giveaway! For the main event page please visit… this page. The last month or so have been an adventure. Yes, sunny Florida girl, yours truly…was sent off to the “Great White North” for three weeks between December and January for new day job training. And by GWN, I mean Syracuse, New York. Okay, so I’m a Chicago transplant to Florida. You’d think that would mean I’m used to winters, right? I haven’t lived in a state that has winter since 1999. I didn’t really even own a “real” coat anymore. My sister had to shop for one for me up in Chicago. Because, you know, Florida sells winter coats in the dead of summer, then gets rid of the inventory. True story. So the first week up there I realized the weather was bi-polar. I arrived to 50 degree weather. The next morning it was in the 20’s. Here’s a picture of me in my jaunty winter hat. Yes, that’s snow in the background. Not only did the weather drop 30 degrees overnight. It also snowed…but it was a light, slushy snow and the weather was back up into the 40’s the following day. Like I said. Bipolar weather. But there were some good things about not being overly cold. It enabled us to explore. And thus my first Wegmans experience was born. Sadly, apparently it was nothing like it should be. I was told Wegmans looks like a castle and is an amazing place to shop. As a girl who has Publix supermarkets every couple of miles, I’m not easily impressed. I was told that this particular store was a bit old and not in a great neighborhood, so not to hold anything against the franchise. 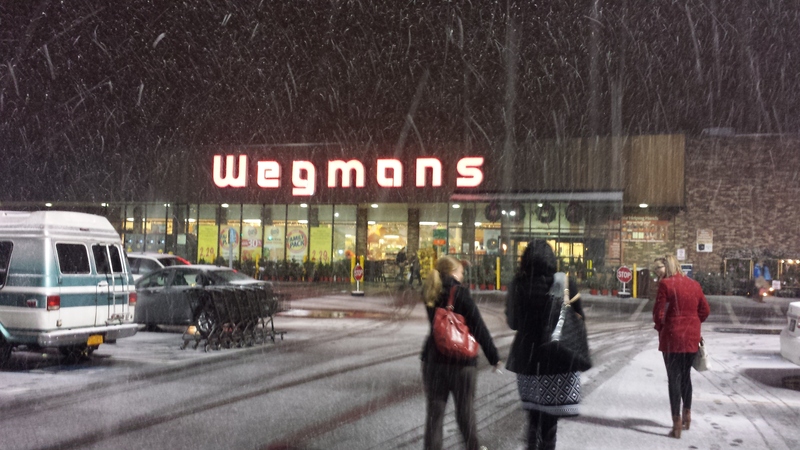 It was not a “true” Wegmans experience. 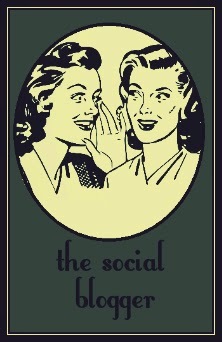 The store was dingy, the employees weren’t overly helpful….so I’ll trust my friends and reserve judgement. Still, a cherry popped while in New York. But despite the cold, both the final game of the season and the first playoff game for my ‘Boys were going on. That meant I wore my Cowboy love quite literally all over my body. Of course, the first person to taunt me? The TSA agent. Before I even left Sarasota. When hubby asked how I responded to the “Go Lions!” taunt, I told him I kept my mouth shut. Even I’m not that brave. Not after a friend of mine practically got cavity searched for forgetting she had a bottled water in her carry on luggage. Nope. But finally, January came to Syracuse…and brought me back into the cold. 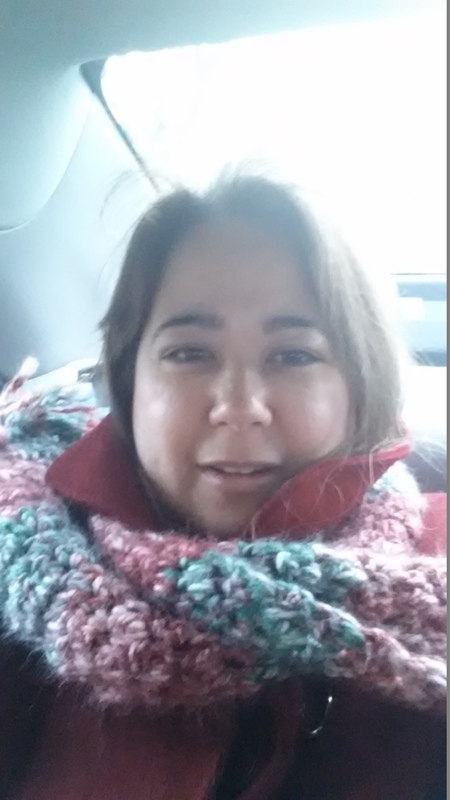 This time, sis had come through with a cute winter coat and hand knit scarf. By then, I’d gotten smart enough to buy boots and gloves. At home, such articles are only purchased for fashion purposes. These were meant to keep my feet warm and dry. Utilitarian. What a novel thought, right? Well, maybe if you’re from the south. And I discovered that gloves have come a long way! Now they have these little spots on the finger tips that allow you to work digital devices like touch screens without taking the gloves off. Well, I do now. And I own a pair. A girl’s gotta stay on the cutting edge of technology, don’tcha know. I confess. I watched my weather updates on my phone like a hawk. When I started seeing sub-zero temperatures I admit it. I got a bit whiny. And what’s with these reports telling us what it “feels like” outside? They calculate in the wind, etc. Do they really think that telling me that 0 degrees is going to feel like -14 degrees is going to encourage me to step away from the warmth of my hotel room? Eek! I was just relieved that the couple of feet they forecasted didn’t come while I was there! The wind was bad enough. You see the picture on the side? 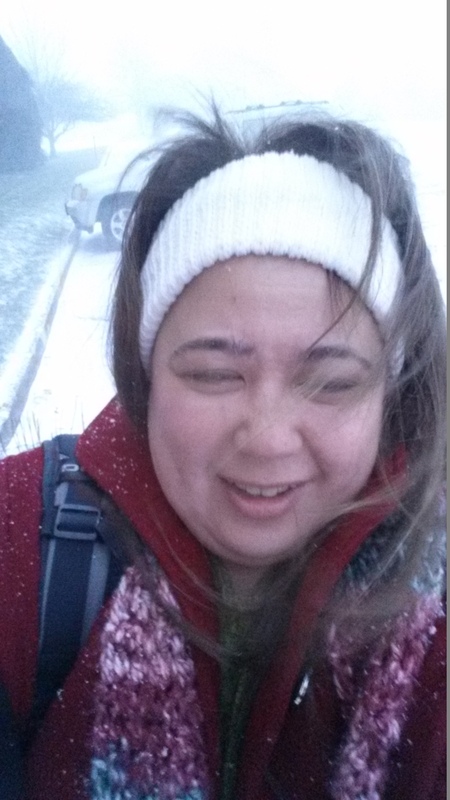 My hair was blowing sideways, and so was the snow! Yes, I found a way to keep my ears warm…. 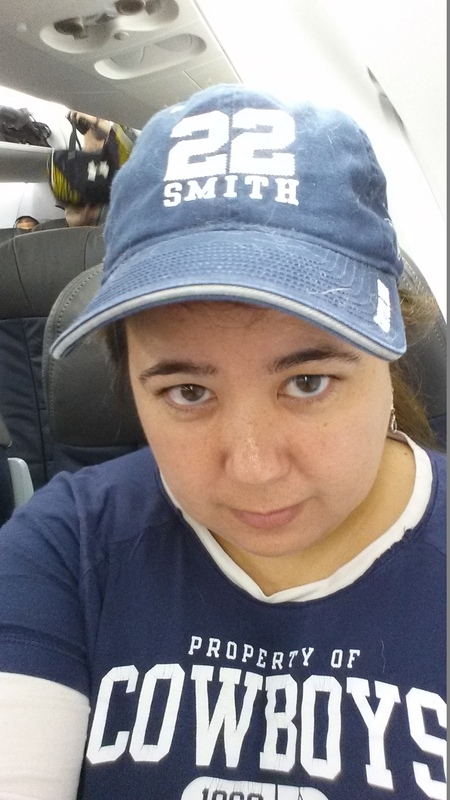 Unfortunately, I also forgot my jaunty hat at home this trip. Just a little hint? That face is not my happy face. It’s my “damn, this is cold” face. If it weren’t for a friend asking me to take snow pictures of myself and the weather, there’s no way I would’ve been out of doors for more than the short time it took to get from indoors to the vehicle, and back inside. 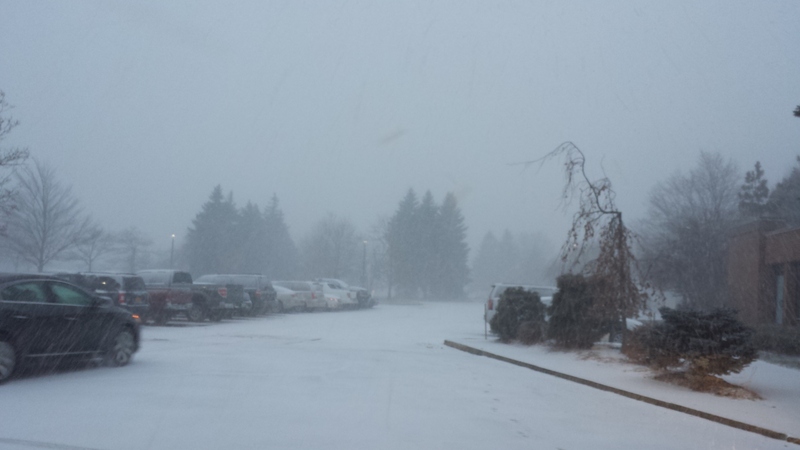 And, believe it or not, despite having not driven in snow in about 20 years, I drove in this weather. Yeah, I’m feeling pretty proud of that, too. But none of that compared to the coolest experience of the trip, ever! It had everything to do with this guy…. My friend, fellow author and blogger, Mark Bialczak braved the freezing cold (and I mean freezing literally) to come out to meet me for dinner. First, if you haven’t met Mark yet, you should check him out HERE. He’s a fun, engaging blogger and an all around great guy. He remembered I love my sports, and was generous enough to bring me a copy of his book, also now a memento of my 3 week stay in Syracuse, and autograph it for me! How cool was that? He even teased me a bit about the book not being about my Cowboys! Even better, despite the fact that the only place we’d interacted was online via our blogs, it felt like meeting an old friend. We never ran out of things to talk about. There was no awkwardness. Just a lot of good conversation and fun! Have you ever met any friends from online? What was your experience? Me? Talking Zombies? No WAAAAY! Okay, so you all know I’m not exactly the Walking Dead fanatic most people (including the hubby) are. Well, except for maybe Warm Bodies, Resident Evil (because who doesn’t like Milla Jovovich, Oded Fehr, or Wentworth Miller), and Army of Darkness (Hello! Bruce Campbell!). But other than that? Nope. Not interested. To be honest, I don’t tend to like the gruesome or creeptastic most of the time. But I love the creativity of my pal, author Lori Whitwam. So I thought I’d introduce her most recent work to you guys. Plus, she doesn’t only write zombies. It’s just her most recent release, The Dead Survive! 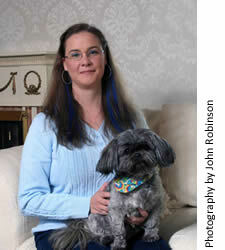 Here’s a little bit about my pal (and fellow dog lover), Lori. She has worked in public libraries, written advertising copy for wastewater treatment equipment, and managed a holistic veterinary clinic. Her current day job, conducted from her World Headquarters and Petting Zoo (her couch) is as a full-time editor for indie authors and small publishing houses. Where can you find her and follow her? I’m so glad you asked! The WordPress.com stats helper monkeys prepared a 2014 annual report for this blog. Thanks for all the love & support this year! The concert hall at the Sydney Opera House holds 2,700 people. This blog was viewed about 48,000 times in 2014. If it were a concert at Sydney Opera House, it would take about 18 sold-out performances for that many people to see it.